A great day covering this great foundation helping children not feel left out and enjoying being kids. 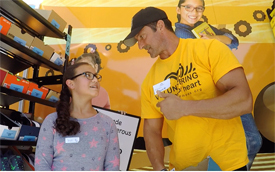 This little truck and foundation have supplied 1000’s of shoes to children all over the state and in the Las Vegas area. This entry was posted in Broadcast production, Cameraman, ENG Camera Crew, Entertainment News, Inside Edition, Las Vegas Production, Las Vegas Video Production. Bookmark the permalink. Upholding clients integrity and identity by delivering high quality and consistent services and products.